"Artichokes," said Joe Beamish, the well-known cultivator of that unctious fruit, "are the most oncertain luxury. Here I comes in town with perhaps the first of that variety of the season, expecting to have Joe Reichl meet me at the station and offer me at least eight dollars apiece for them, but, as he tells me, there ain't a single Kansas millionaire on the register and Izzy Klingenstein is most impartial to artichokes, so the best he could do for me was two-bits for the pair,"
With that weight of gloom on the chest of a man of my finicky temperament, the Orpheum is the only place it can comfortably evaporate, so, as Billy Van says, getting confidential, "Lemme tell you," the Vindabonas, all the way from Europe -- and I've got Hambletonian Klein's word for it -- whether there's a heavy duty on a name like that or not, they sure slipped by Ellis Island with a brand of Harmony that would make the tariff on nutmegs look like a debate between a Petaluma cheese and a Yacqui sandwich. ...idea that gravitation is all the bunk, the way they handle bikes and wheels. Pete Donald, the brawny Scot, and Miss Neta Carson do a Highland terpsichorean stunt that has the flavor of the heather and blue bell. Closing, we get a taste of the Sunny South. Now, on the low-down, between ourselves, I'd sell out the artichoke farm in a minute if I knew I could see Mike out in the field talking earnestly and eloquently now and then putting his index finger in Hank O'Day's eye -- and I guess there's lots in the Bronx as would, too. Here's another J.R. Williams Out Our Way postcard issued in the 1950s by the Standley-May Company of Albuquerque. On this one they didn't even bother to remove the original NEA copyright and date. You'd think it would be worth their time to rout that stuff out so as to make it look like Williams produced this panel especially for the postcard. 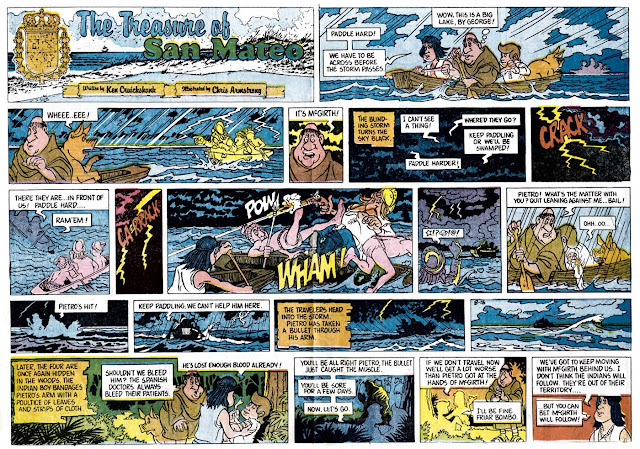 Based on only two examples in my collection, and one more I found online as original art, The Treasure of San Mateo shows a lot of promise as an historical adventure set in the early days of Spanish rule in Florida. 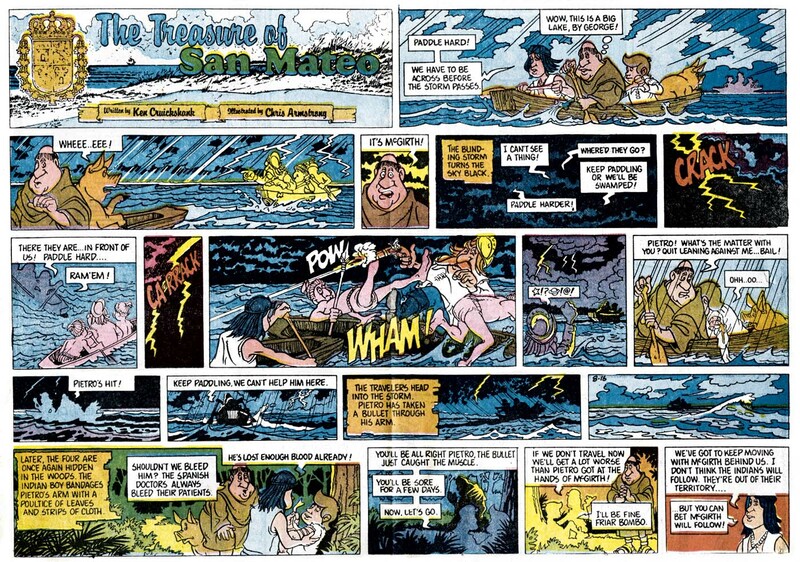 My tearsheets are just clippings and therefore anonymous as regards the source newspaper, but the credits to writer Ken Cruickshank and artist Chris Armstrong are enough to pretty well guarantee that this strip ran in the Jacksonville-based Florida Times-Union. Both fellows were employed there in 1981, the year in which these strips saw print in their Sunday comics sections. I have no idea how long this strip ran in the Times-Union or whether it was syndicated to other papers. Unfortunately artist Chris Armstrong, who later made a prominent name for himself as a fishing magazine illustrator, has since passed away, and I have been unable to determine the present whereabouts of Ken Cruickshank. Any information you strippers can share about The Treasure of San Mateo would be gratefully appreciated. Thanks Ben, I'll update the Elwood post. From that last strip you found, it looks like Elwood may have become a little more 'soapy', a la Funky Winkerbean, in its last years. I'd like to see more. Hello, greetings from Brazil. What an amazing blog! Reading your discoveries of obscurities, it reminded me of a comic strip released here in 1976, translated as "Don Piloto". The strip appears to be from the US and it was distributed by the United Feature Syndicate. There is no author and its origin remains a mystery to this day. 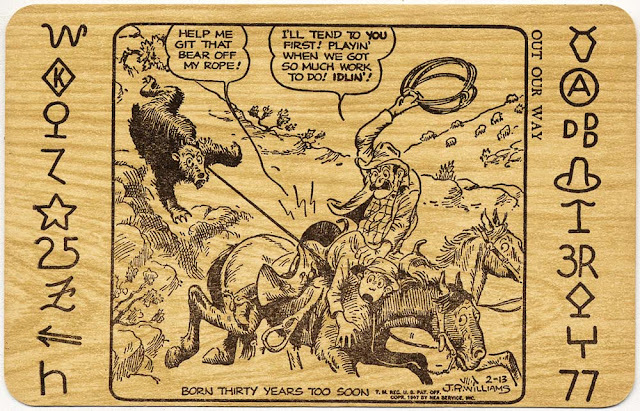 \Those images are from the US comic strip Don Patrol by Gary Patterson. It ran here 1975-76. Hi Allan, thank you very much! Following your clues, I found out that Eli Bauer also worked on it. The Monthly Edition of the New York World seems to have been pretty well lost to history. 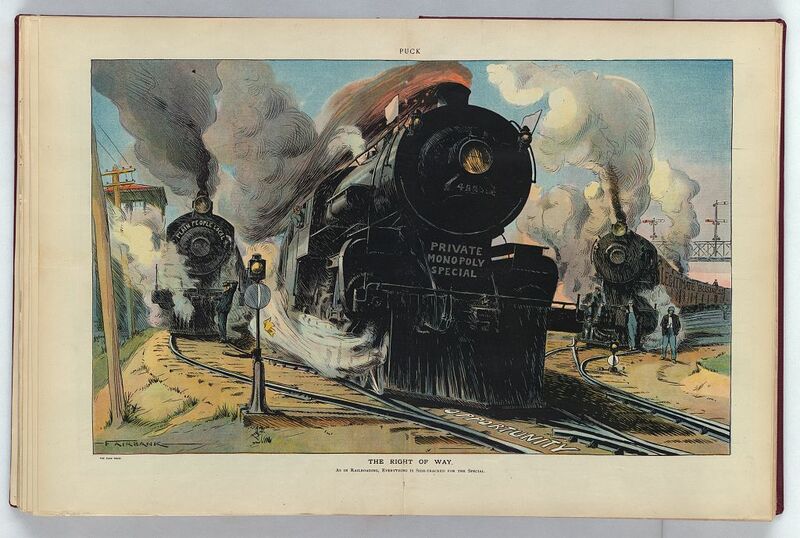 From the few examples I have and the few tidbits of information I find online, I gather it was sold nationally by subscription in the 1880s and 90s. 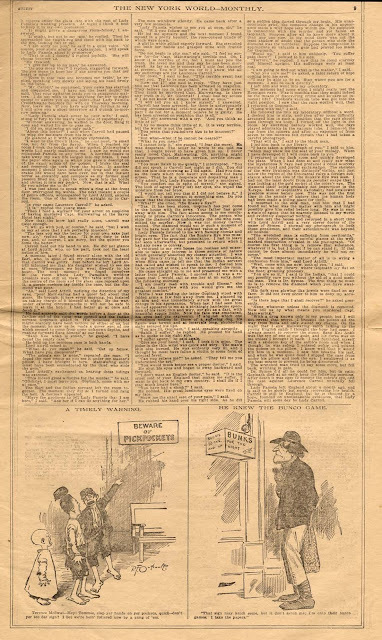 The tabloid issues contains newsy material plus a mix of history, fiction and general articles of the sort you'd find in the likes of Harper's Monthly. I gather that the main incentive to subscribe was that each January issue was a monstrous thick World Almanac and Encyclopaedia, often weighing in at more than 500 pages of material ... though a healthy percentage of that was advertisements. I used to have some other editions of the monthly World from the 1890s, one I recall had for its main story a ghastly tale of a medieval central European queen who ritually would bathe in the blood of her teenaged virgins, prompting her terrible overthrow. I'm sure it wasn't real. Another had a story about an African tribe of men living in trees that had tails. 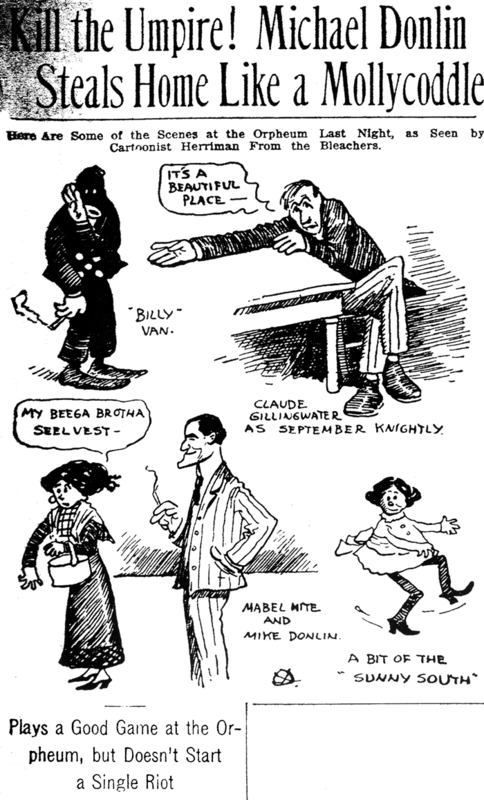 There was a monthly version of the Chicago Inter-Ocean and for years, right into the WWI era, the "Atlanta Tri-Weekly Constitution". Beaumont M. Fairbank was born on December 30, 1876, in Brooklyn, New York, according to his Social Security application which had his middle name as Moulinear then Moulineror. Fairbank’s middle name was Molinar on his World War I draft card. Fairbank’s parents were Beaumont H. Fairbank and Emma Meeks who married in 1872 in Manhattan, New York City. The 1875 New York state census recorded Fairbank’s parents, brother William, and maternal grandfather Charles Meeks in Brooklyn on Schermerhorn Street. Fairbank’s father was a jeweler. In the 1880 U.S. Federal Census, Fairbank, his parents and older brother were Brooklyn residents at 146 Lawrence Street. Brooklyn directories dated 1888 to 1890 listed the Fairbank family at 594 Halsey Street. According to the 1892 New York state census, Fairbank’s maternal grandfather was part of the household at 584 Halsey Street. Information about Fairbank’s art training has not been found. Fairbank was an artist in the 1900 census. He would make a career of illustrating trains. Fairbank resided with his parents and brother, a journalist, in Brooklyn at 823 Quincy Street. The 1905 New York state census said Fairbank and his parents were in Brooklyn at 1969 East 14 Street. The Fairbanks’ address was unchanged in the 1910 census. Newspaper illustrator Fairbank and his wife had a newborn son Loren. They were part of Fairbank’s father’s household. Fairbank’s art was published in some of the leading magazines and newspapers such as Puck, May 25, 1910, Life, February 1, 1912, and New York Tribune, August 28, 1921. In the 1915 New York state census, Fairbank was the head of the household which included his parents. Their Brooklyn address was 1542 East 14 Street. Fairbank signed his World War draft card on September 12, 1918. He was a newspaper artist employed by the Brooklyn Daily Eagle. His home was in Brooklyn at 1428 East 14 Street. Fairbank’s description was slender build, medium height with black hair and brown eyes. Fairbank drew Open Throttle and Heavy Grade which ran from October 4 to December 20, 1914 in the Eagle Sunday Magazine. 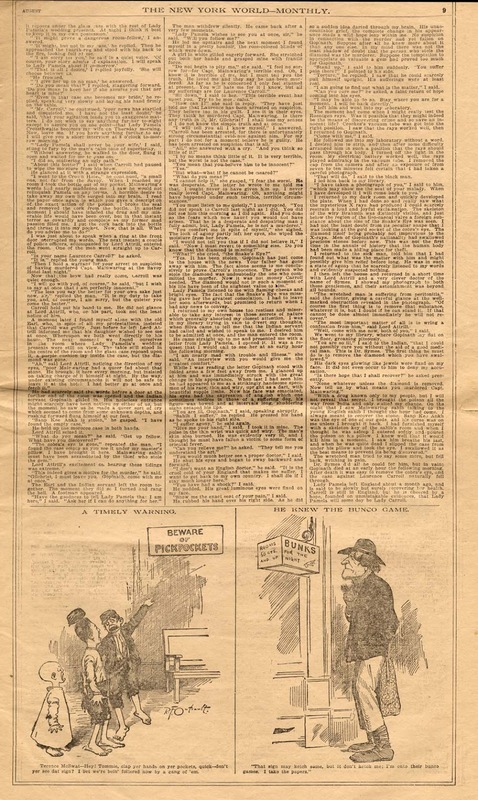 In 1917 Fairbank provided spot illustrations for the Eagle’s “News of the Week" column which was retitled “The Week End” in the summer of 1918. Here are links to several columns: 2/3/1917; 2/17/1917; 2/24/1917; 3/3/1917; 3/10/1917; 3/17/1917; 3/24/1917; 3/31/1917; 4/7/1917; 4/21/1917; 3/2/1918; 4/13/1918; 4/20/1918; 5/18/1918; 6/22/1918; 7/6/1918; 8/3/1918; 8/24/1918; 8/31/1918; 9/7/1918; 9/14/1918; 10/26/1918. The 1920 census recorded Fairbank in his father-in-law’s household; Charles Miller was a real estate agent. Fairbank was a self-employed illustrator. They lived in Rockville Centre, New York at 21 Irving Place. The 1925 New York state census said Fairbank continued to be in his father-in-law’s household in Rockville Centre but at a different address, 110 North Lee Avenue. In the 1930 census, Fairbank was head of the household which included his father-in-law and two brother-in-laws. Fairbank was a newspaper artist and his son a photographer. Fairbank has not yet been found in the 1940 census. He was in the 1942 Rockville Centre city directory at 110 North Lee Avenue. Some time between late 1948 and early 1949 Fairbank passed away. The Leader, March 24, 1949, published the following article. The March-April exhibition of paintings was opened Saturday at the Freeport Memorial Library. Most of the exhibitors are members of the Freeport Artists Guild. The north wall features works of Beaumont Fairbank of Rockville Centre, an Artists Guild member who died recently. Mr. Fairbank won top honors in the popular vote award in November with his painting “Mail Train in Snowdrift.” A resident of Rockville Centre for thirty years he was born in Brooklyn seventy years ago. 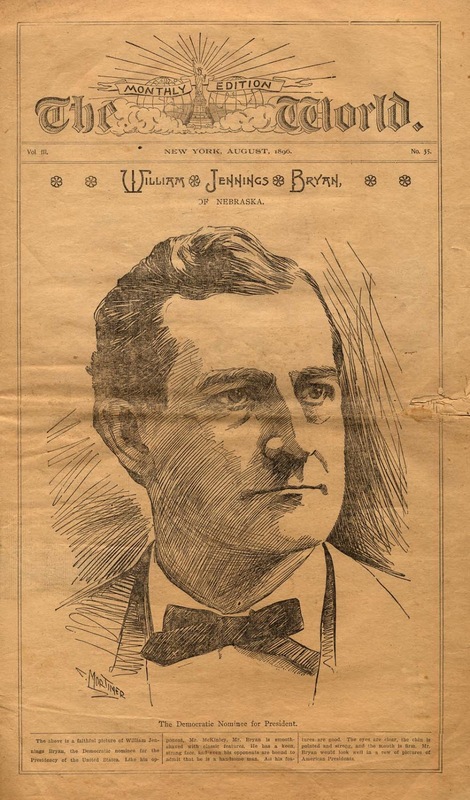 He lived in Brooklyn for thirty years, and was known for his work in the Brooklyn Eagle. He did many comic strips, one entitled “Railroad Red.” He also did many magazine covers. 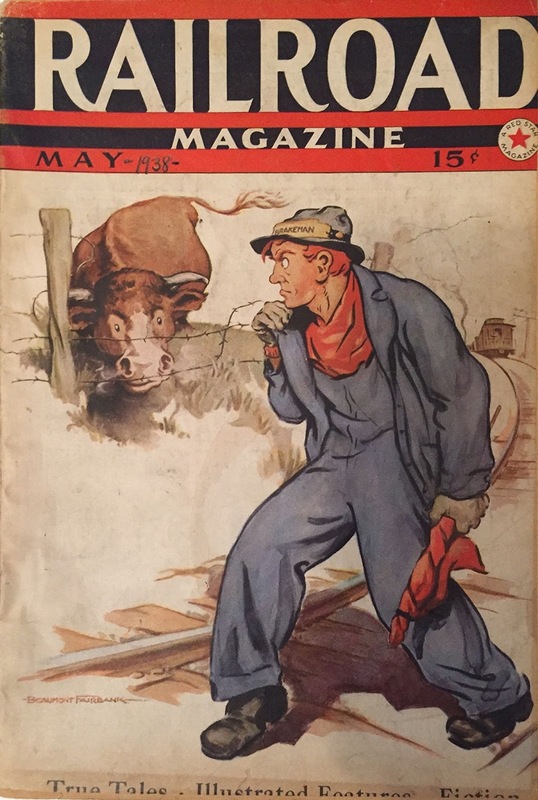 His colored reproduction of the January 27, 1923 Literary Digest cover is exhibited in the Library. 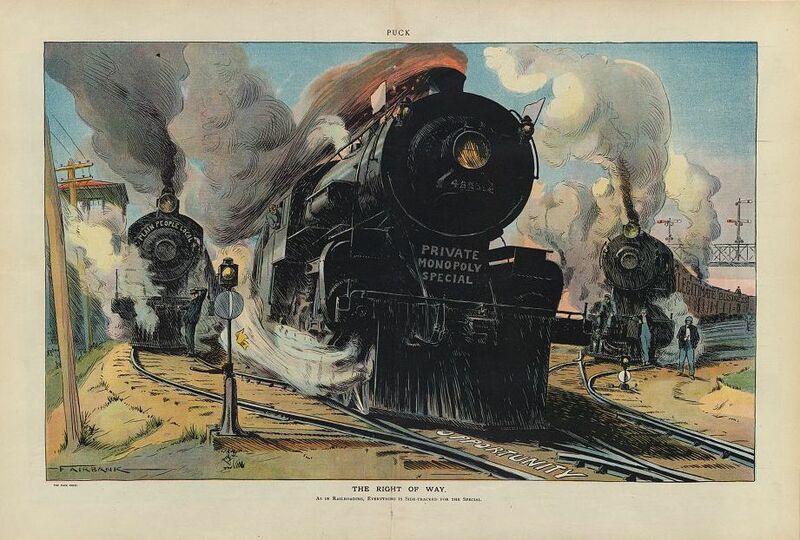 There is also a pastel of a train, entitled “Express” and a black and white drawing.